The built-in localization mechanism in Silverlight and WPF allows you to localize any string resource used by the RadDateTimePicker control. Once translated, you might use your resources in both Silverlight and WPF projects without changing anything. To learn more about the ways to localize the controls from the UI for Silverlight suite please read the common topic about Localization. 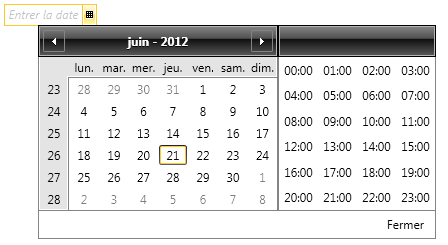 The days of the week and months are automatically localized by the DateTime class using the current culture settings of the application. The TodayButtonContent is considered as the ResourceKey of the button when it is set.